Our B2B marketing services cover every aspect of the marketing funnel, helping you grow sales pipeline and drive revenue. Learn more about B2B marketing and how you can generate more revenue through pipeline marketing. Get to know Brainrider, our leadership, what we stand for, and what makes us the right partner for your B2B marketing needs. Your company is ready to embrace account-based marketing. All that’s left to do now is figure out how to get started. 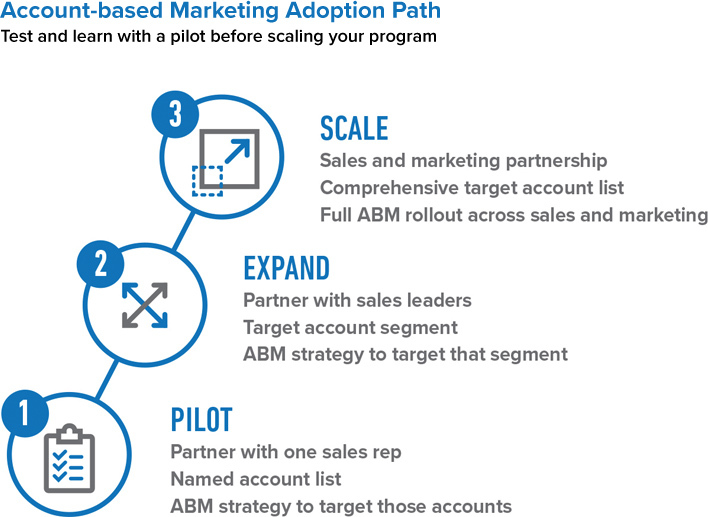 Let’s start with a refresher: what is Account-based Marketing (ABM)? ABM is a highly targeted, personalized marketing approach that focuses on engaging the accounts that matter most to your organization. Implementing an ABM strategy requires a lot of time, energy, and as with pipeline marketing, a collaborative effort between sales and marketing. 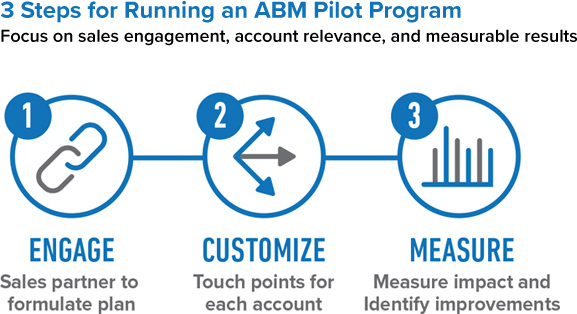 So, what does a reasonable, actionable and measurable ABM plan look like? The simplest way to answer that is to look at what not to do: don’t invest in new ABM tech or launch a global ABM program just yet. Starting small will give you the agility to make frequent course corrections as you gradually roll your program out to incorporate more and more accounts. You can then leverage pilot learnings to expand and scale your ABM program successfully. There are three steps to running a successful pipeline ABM pilot program structured for continuous improvement and growth. You’ll need to collaborate with one of your colleagues in the sales department in order to succeed. That doesn’t mean that you need full sales team buy-in. In the beginning, you’ll need just one account executive or sales manager who is interested in experimenting with you. Together, agree on a handful of strategic accounts to target. Identify measurable marketing and sales goals and metrics for each target account that will guide your account-based marketing plan. Be sure to take a snapshot of how your current programs are performing on those metrics so you will have a baseline to measure lift later. What are the sales objectives and priorities for the account? Are they trying to improve account mapping and contact coverage across the account? Are there engagement or revenue goals associated with the account? Start small and focus the pilot phase on proving that an account-based marketing approach will work for your organization and create value for your sales team. In the spirit of keeping it simple, incorporate account-based customization into some of the marketing tactics and touch points you’re already executing. Try to do what you can with the tools you have. Your digital advertising platforms, marketing automation platform, CRM and website content management system can be powerful ABM tools with the right plan and execution. Digital advertising. Narrow your targeting parameters to zone in on your target accounts. Customize more generic ad creative, offers and calls-to-action (CTAs) to connect with your target. Content assets. Spin out customized versions of ebooks, infographics, articles or one-pagers with simple changes to titles, cover pages, background images and industry-specific jargon. Landing pages, forms, nurturing emails and direct mail. Grab the visitor’s attention by leading with segment-specific language and imagery. Use lookalike customer logos or testimonials for social proof, and use custom CTA language. Website content. Update generic headings and copy with target-specific references and keywords. Replace generic images with customized versions. Swap out generic conversion mechanisms with more custom calls-to-action and content asset downloads. Customizing your existing campaign assets isn’t as complex or resource-intensive as it sounds. An on-demand webinar I recently presented includes some concrete examples of simple modifications to ads, landing pages, forms and website content that can have a big impact on campaign relevance for target accounts. How do you approach customization? 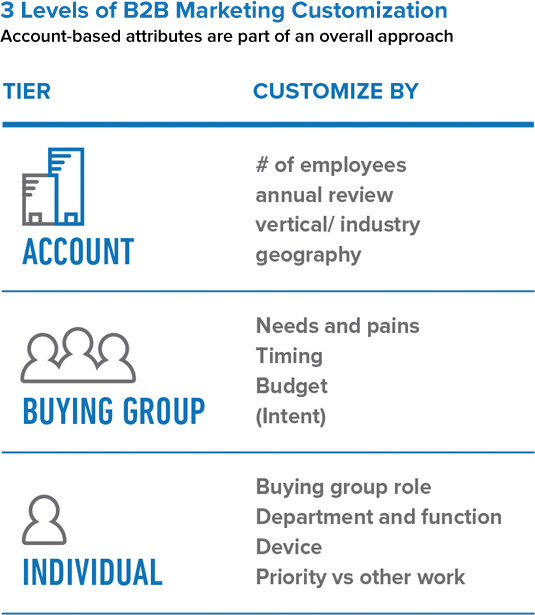 Consider how you might segment your target accounts to customize your campaign touchpoints for each target account by using some of the common ABM account attributes: company size, industry vertical or geographic location. Which attributes will have the most meaningful impact on your messaging and content for one target account versus another? Then imagine or mock up how you could create customized versions of some existing campaign touchpoints for a few different target accounts by making simple changes to headings, copy or images. The goal is to customize generic campaign assets using company-level attributes to make the assets more relevant and engaging. Remember that you are overlaying an ABM approach onto your existing marketing strategy, so experiment with customizing at the account level but also at the individual prospect/lead and buying group/opportunity levels. As you run your ABM pilot, lots of knobs and dials can be turned in order to balance the required effort and investment with the expected increase in relevance and engagement over your baseline metrics. It is impossible to predict the right approach, so instead approach tactics with test-and-learn mindset. In the first 90 days, keep your measurement expectations reasonable. If your organization deals with long buying and selling cycles, you may not make a significant impact on marketing-sourced opportunities or revenue in the first few months. But you may be able to track marketing-influenced opportunities and revenue for the target accounts you’ve been focusing on. You should also see short-term improvements in your campaign performance metrics. Focus on the higher value campaign metrics like cost per acquisition, visitor-to-prospect conversion rate, call-to-action conversion rates, and contribution to your account manager’s goals like discovering new account contacts, influencing members of a buying group or engaging with key contacts more than before. By demonstrating lift on those high-value campaign metrics early in your ABM program, you will be able to make the case for continued investment. When you approach your ABM program as a series of incremental phases of expansion, rather than one big strategic initiative, you’ll be able to build momentum, buy-in and expertise along the way. *A similar version of this article was originally published on Forbes.com. Brainrider is a full-funnel marketing agency that helps B2B companies like yours get started with account-based marketing. If you’re interested in adopting an ABM strategy, scaling your ABM efforts, or are looking for some help executing ABM campaigns, contact us today. Brainrider can help you get better results with a B2B Website update, best practice marketing planning & execution, or a Pardot marketing automation implementation. A simple way to prioritize your objectives, identify gaps and execute a better marketing program.